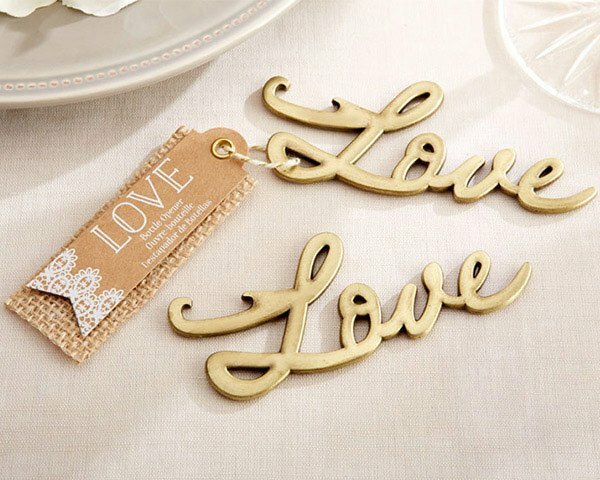 Share the love on your special day with our Love Antique Gold Bottle Opener. It's a party favor that will remind your guests of your amazing event each time they pop open a drink! To make it stand out even more, you can tie one to a bottled drink for each guest. The vintage-inspired antique gold "Love" bottle opener includes a decorative burlap-backed gift tag with delicate doily design and "Love" printed in white. As one of our top rated and most popular items, we've received tons of praise for this bottle opener. Customers describe it as "elegant, but a great value" and "looks perfect at each place setting." They appreciate how "sturdy the bottle opener is" and "it hasn't broken in the 2 years since I've kept it around". The metal is described as "an elegant" "semi-shiny" surface and the "Item was nicer than I expected for the price". To top it off, it's backed by our award-winning Customer Service, based in Minnesota. You can count on reaching a live-human to help make sure everything is taken care of. We are the highest rated Wedding Favor company on Wedding Wire. Be wary of fly-by-night companies with few ratings! Product dimensions: 3.75 W x 1.5" H.
I'm wondering if the Love Antique Gold Bottle Opener comes in packs when you order or if they are individually priced? 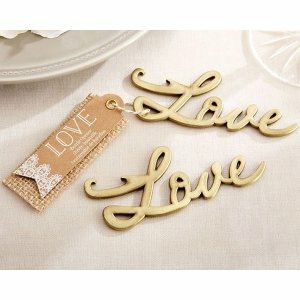 The Love Antique Gold Bottle Opener are indvidually priced, but we price bulk orders in tiers. So the more you buy, the bigger the discount. can you personalize the tags? under Love can it say Mr. & Mrs. Smith 09/22/18? Unfortunately, the Love Antique Gold Bottle Opener can't be personalized but you can purchase a personalized tag separately by clicking here. Hello, can the bottle openers be customized? Unfortunately, the Love Antique Gold Bottle Opener can't be personalized. They include a decorative burlap-backed gift tag with a delicate doily design and "Love" printed in white. I am looking at the love bottle openers. Can the tag be personalized with the couple's name and date? Unfortunately, the Love Antique Gold Bottle Opener can't be personalized. It only includes a decorative burlap-backed gift tag with a delicate doily design and "Love" printed in white. My order number is 2784967. I bought these for my bridal shower and wondering if you can personalize them? Please let me know if you have any questions or if the request can be done. Love the favors! Cant wait to receive them! Hi Candice! Unfortunately, we're unable to pull up an order using your email and the order number you've provided. Please contact us via phone or LiveChat so we can further assist you.